Forget radiant heated floors: the Manawan brings the warmth and comfort of Sorel inside, making them perfect at home or in the lodge. This classic suede slipper is lined with an acrylic/wool blend that’s soft and warm—just what tired feet need after a long day out in the cold. Inside, a soft, pile-lined removable EVA midsole provides added comfort and natural arch support. Natural rubber outsole provides excellent indoor traction. I bought this for my husband to replace the Wicked Good slippers I bought for him 4 years ago. The stitching was coming out of those. Although he really like his WG's he wanted something with a sole that he could wear outdoors in the garage and just running to the hardware store on Saturday mornings. These are really doing the job for him. He says they are his favorite pair of shoes ever and even wore them to work on a Sunday the first week he had them. They seem like great quality and we think they will hold up better than his WG slippers did. I work from a 3 season porch and in the winter the floor is quite cold. These slippers keep my feet very warm. They are comfortable and hold up well. I wear mine from October thru March, 7 days a week, all day. Two years in they are in great shape. 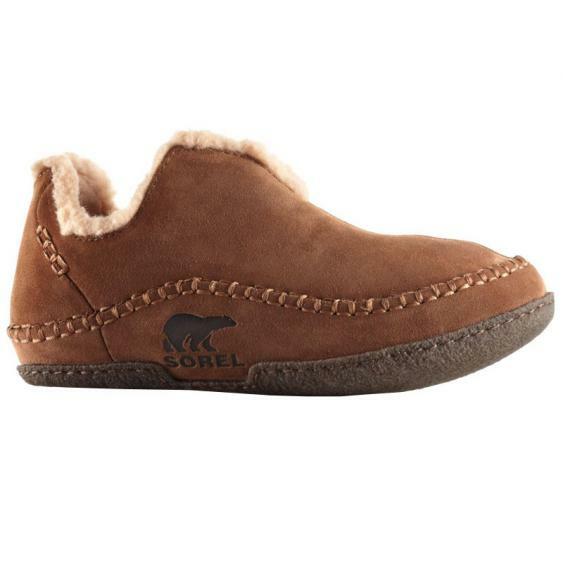 My new Sorel Manawans are cozy and comfortable. They run pretty wide, but stay on my slender feet without any problem. Shipping was quick and response from Dodd's was timely and helpful. Shoes were higher quality than expected! The price and customer service experience was awesome too! Look forwRd to future shoe purchases! Excellent quality and excellent service, I will always go back to them !